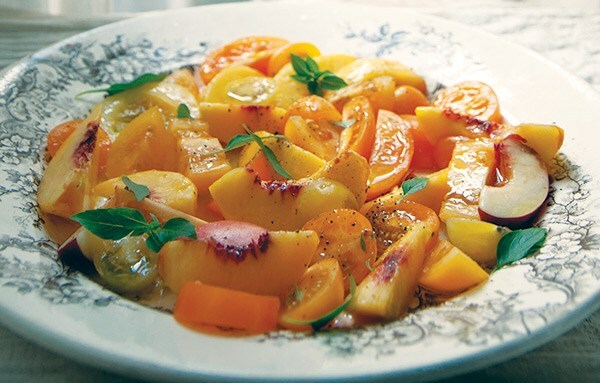 From gorgeous tarts to salsas and salads, learn how to incorporate this savoury summer fruit into your everyday meals with our fresh and flavourful tomato recipes. 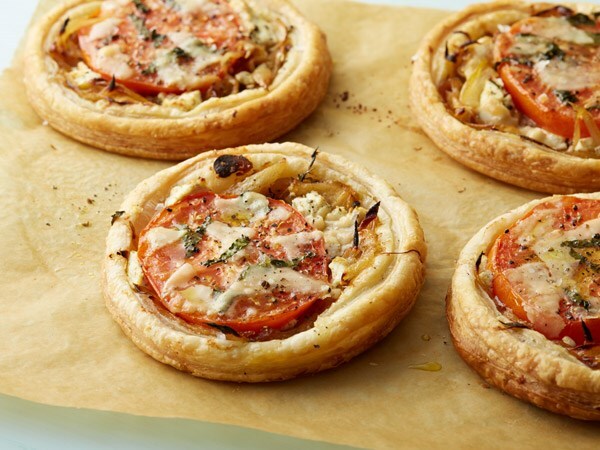 These aromatic, cheesy tarts make an appetizing and vegetarian-friendly dish. Pre-made pizza dough makes this easy dish super quick to prepare. 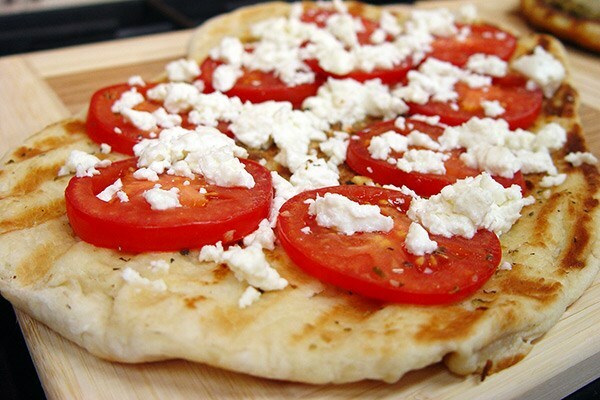 Top with ripe tomatoes and salty feta cheese and heat through. 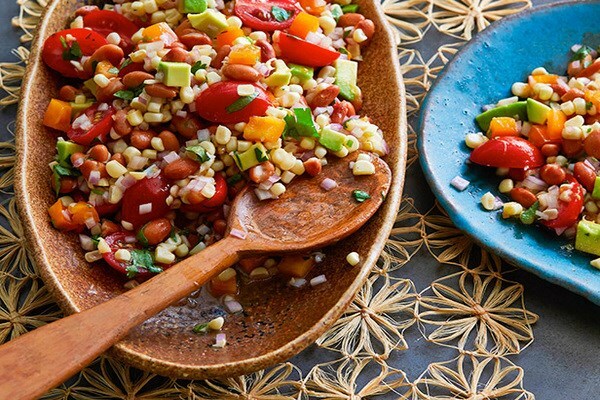 Creamy avocado, hearty pinto beans, fresh cilantro, corn and tomato make for a quick and healthy winning salad. 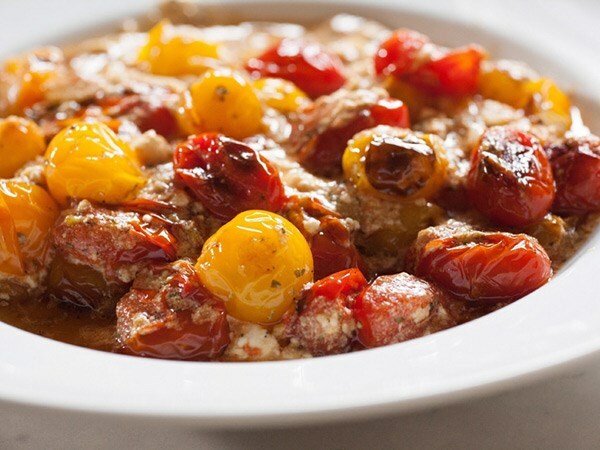 The "snow" in this recipe actually refers to French feta cheese, which is generously sprinkled on top of blistered cherry tomatoes. 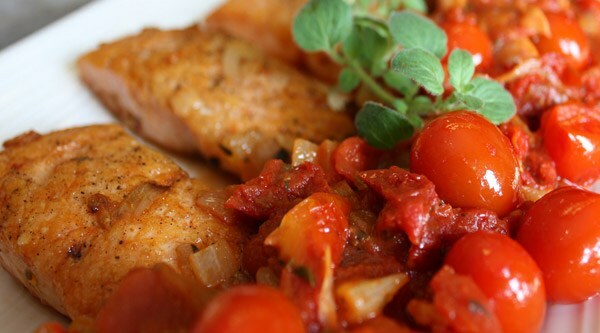 Bookmark this meal for your Labour Day soirée, and slice into a bit of sun protection from lycopene-rich tomatoes. 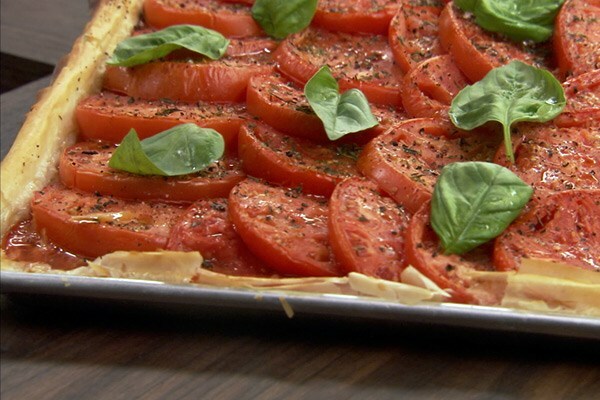 Get a taste of the Mediterranean sunshine safely with this fresh tomato puttanesca-style dish from Giada. If you're in need of a quick lunch or dinner, this 15-minute open-faced sandwich will do the trick. 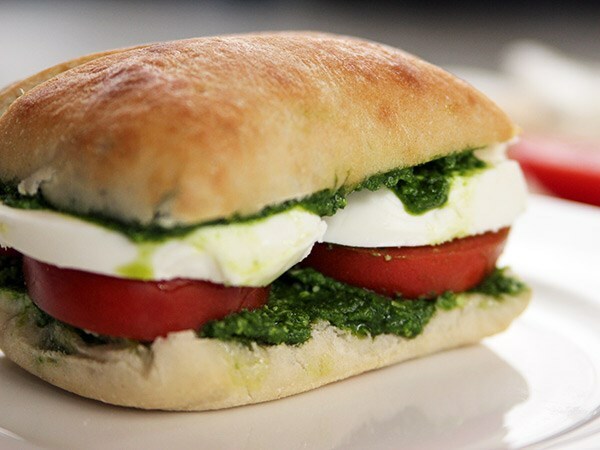 It's hard to pass up a simple sandwich filled with bright, herby pesto, fresh tomatoes and thick slices of fresh mozzarella. 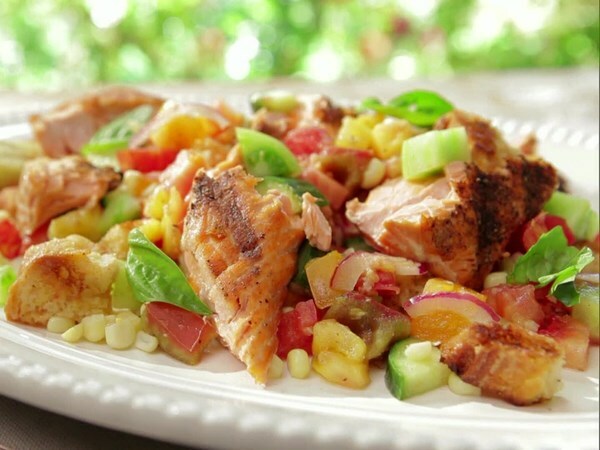 Bursting with fresh flavours and pops of colour, this rich, tender salmon salad is packed with chopped tomatoes, corn kernels and chewy Tuscan bread. 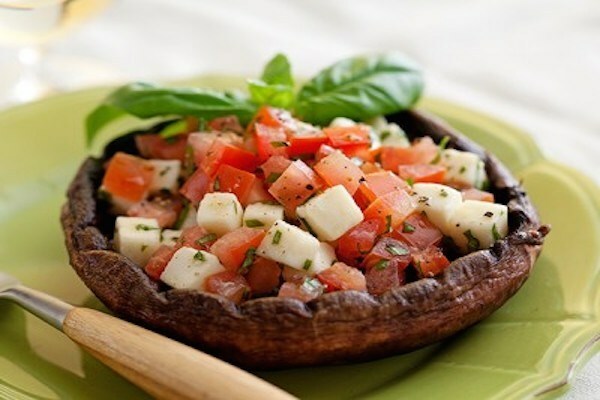 Meaty portobello mushrooms act as edible bowls filled with summer tomatoes, gooey mozzarella and zesty herbs in this irresistible vegetarian main. 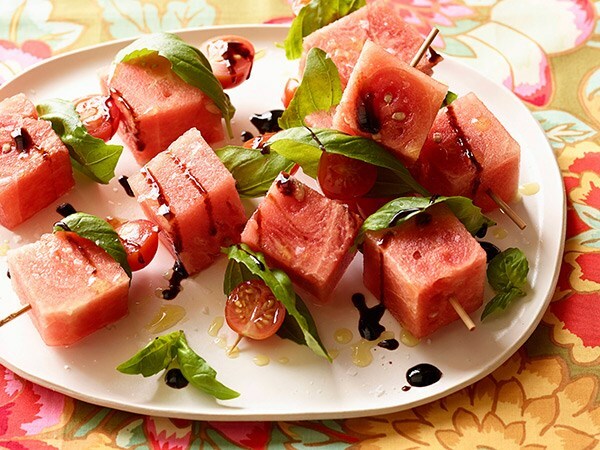 Perfect Pairing: Serve it with a sweet Pure Leaf Tea-lini for a fresh meal bursting with summer fun. A pasta recipe that packs in salty, bold Mediterranean taste, ready in a flash. 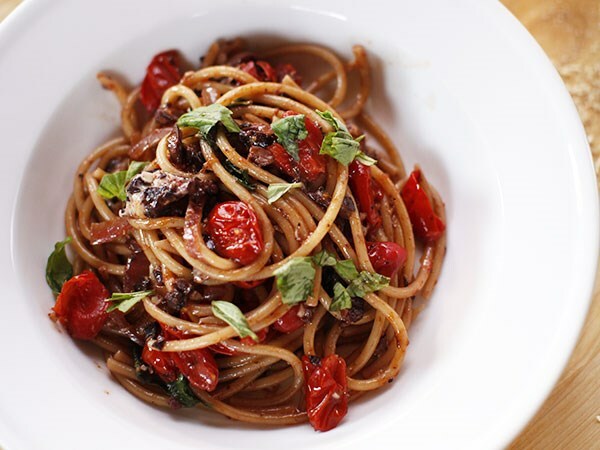 Pantry must-haves olives and pasta come together with fresh tomatoes, basil and Parmesan, for a healthy Italian meal that satisfies. 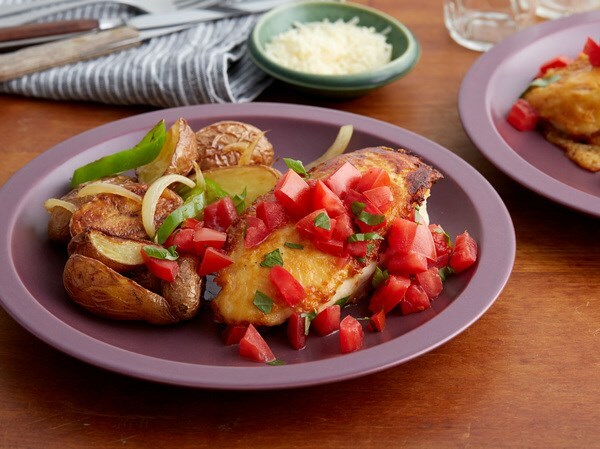 Ready in under 30 minutes, Rachael Ray whips up a flavour-packed dish of Parmesan-crusted chicken topped with tomatoes and basil, and served with crispy roasted potatoes, peppers and onions. 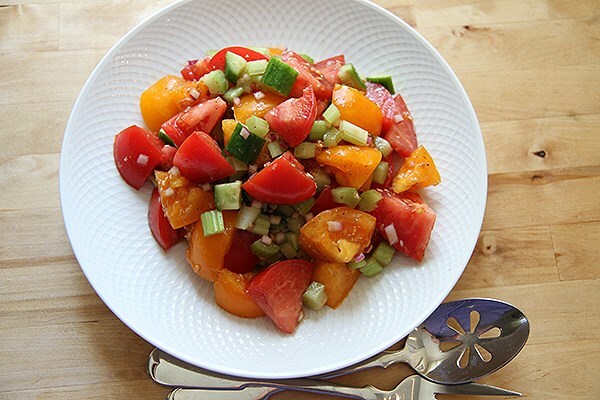 Tomatoes are a low-carbohydrate salad option rich in heart-healthy lycopene. They’re employed in this zippy, fresh recipe that takes the classic Canadian Caesar drink beyond the glass. 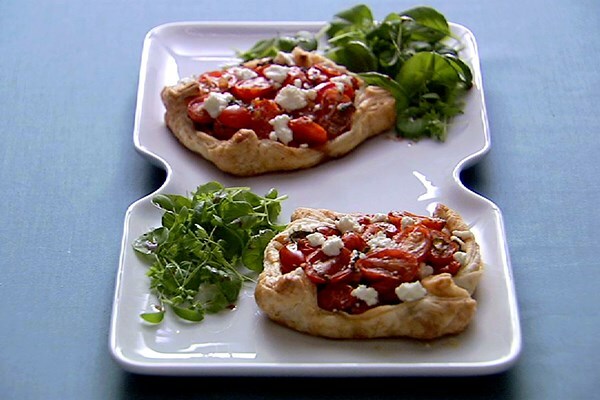 These individual tarts balance the sweetness of grape tomatoes with the tang of balsamic vinegar, fresh basil and goat cheese. They’re hearty enough to stand alone as a main, but can also be served as an appetizer. Claudia McNeilly is a food writer living in Toronto.. 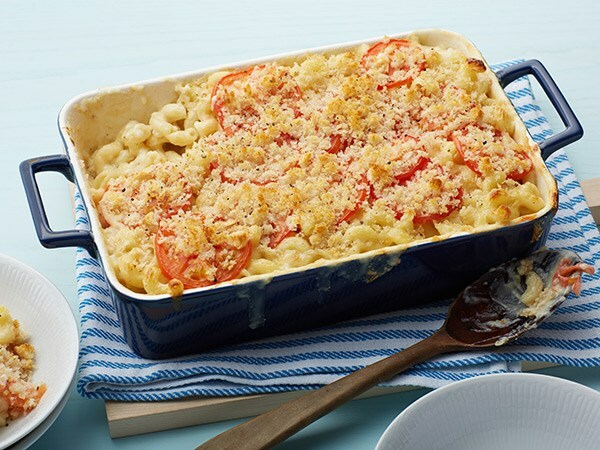 Nutty Gruyère ensures the sauce in this family favourite stands up to the toothsome macaroni and sweet roasted tomatoes. We're certain you'll agree with Giada about her satisfying panzanella salad recipe: "I love my Artichoke and Tomato Panzanella," proclaims Giada. "It is a great go-to recipe because I always have the ingredients in my pantry. 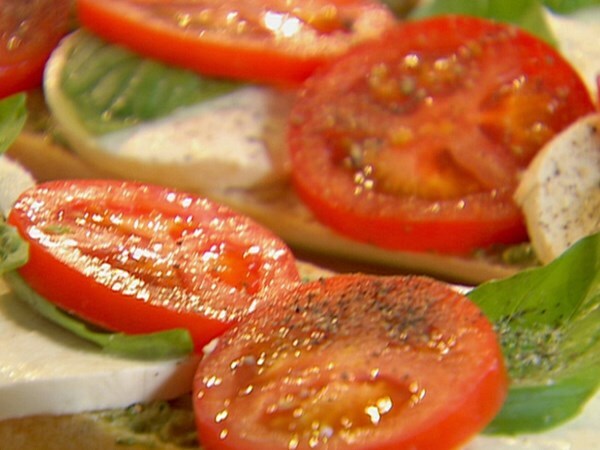 All the colours and flavours of the tomatoes, artichokes, basil and olives make this a tasty and vibrant dish." 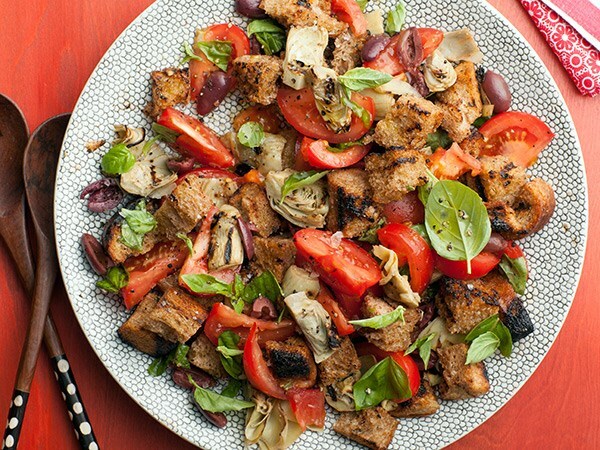 Get the recipe for Artichoke and Tomato Panzanella. There’s nothing like a piping hot bowl of curry on a cold winter day. 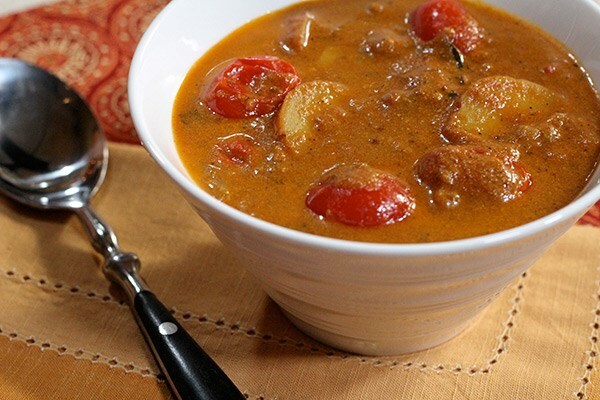 This authentic vegetable curry with cherry tomatoes and baby potatoes is sure to set your senses on fire. Get the recipe for Bal Arneson’s Traditional Vegetable Curry. Erica Rae Chong is a Toronto-based writer who loves experimenting in the kitchen and discovering trendy food hotspots. When she's not munching, she's out exploring her city and abroad. Follow her on Instagram at @ericaraechong. 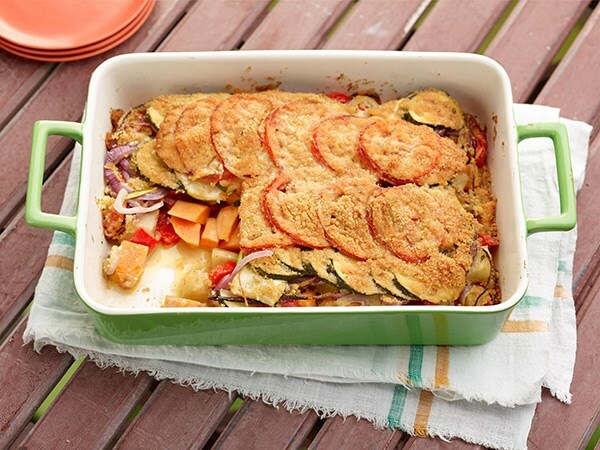 This Italian casserole is packed with potatoes, yams, bell peppers, carrots, zucchini, red onion and plenty of tomatoes. Finished off with grated Parmesan and Italian-style bread crumbs, this dish is then baked until golden and crispy on top. This 15-minute olive oil-based pasta features salty capers, olives, basil, garlic, parmesan and grape tomatoes. Bellissimo! 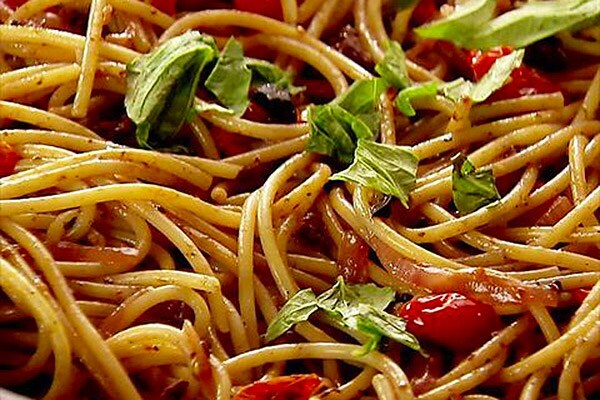 Get the recipe for Ree Drummond's Pasta Puttanesca. This recipe couldn't be easier — just cut up the veggies and toss everything together. This tomato and herb salsa makes a great addition to any grilled meal. Serve with a grilled main for a delicious taste of summer at your next backyard barbecue. 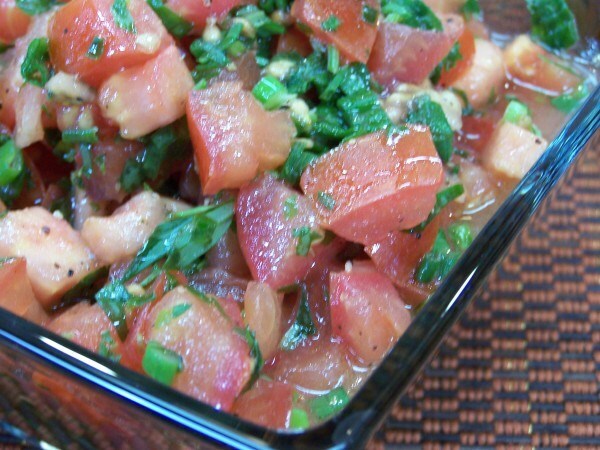 Get the easy recipe for this Tomato Tarragon Salsa here. 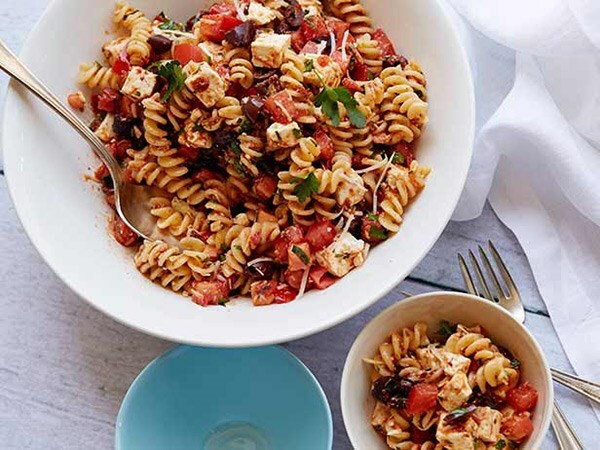 This delicious Greek-inspired pasta salad is packed with bold flavours, fresh vegetables and big chunks of feta cheese. 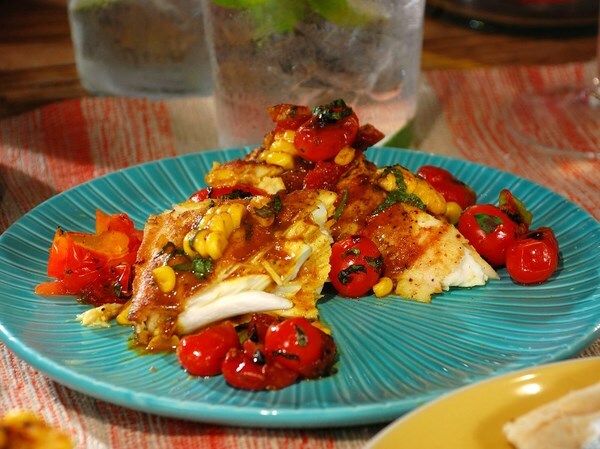 Guaranteed to be a hit at your dinner table, this flavour-packed main features halibut topped with a corn-coconut curry sauce and finished with griled cherry tomato chutney for a burst of freshness. Just because winter’s here doesn’t mean we can’t still have a wee taste of summer. 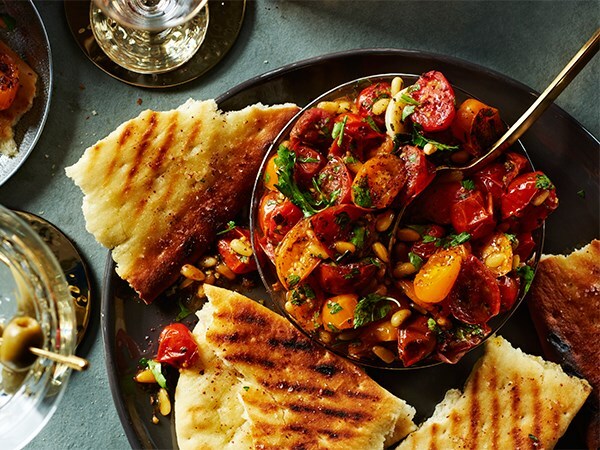 By roasting tomatoes to boost their sweetness, then adding more flavour and crunch with tart sumac and toasty pine nuts, this simple condiment would be fantastic on some warm pita wedges slathered with goat cheese. 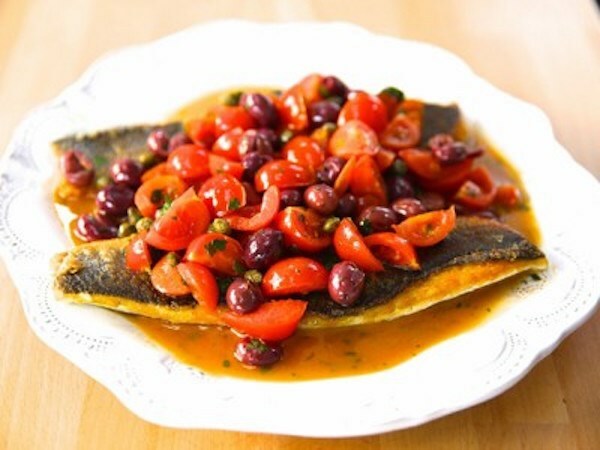 Get the recipe for Sumac Roasted Tomatoes with Pine Nuts and Herbs. Whip up some fresh and delicious appetizers that seamlessly blend all your favourite flavours of summer into one tasty dish. 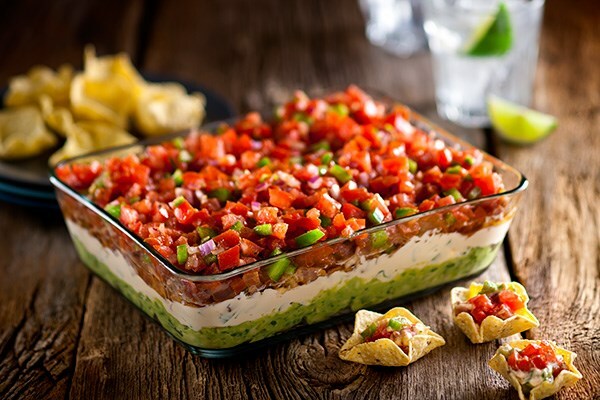 Experience a fiesta in your mouth with this dip, layered with avocado, cheese, bacon and colourful tomato salsa. 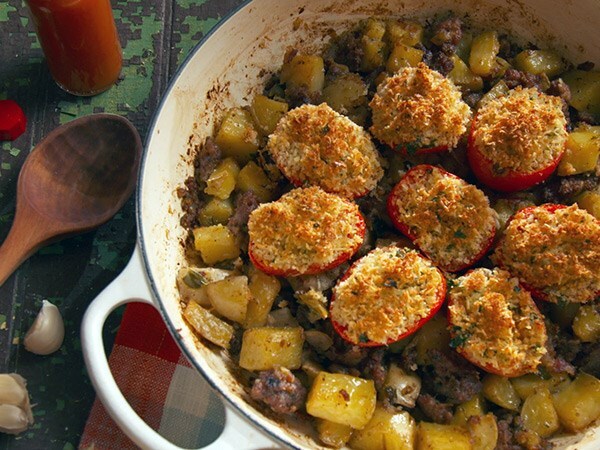 A truly comforting brunch dish, this one-pot wonder pulls out all the stops; veggies, bacon, potatoes and breaded baked tomatoes. 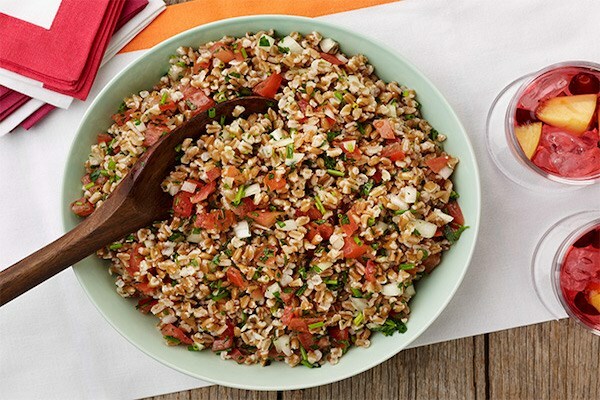 With a medley of vibrant colours and juicy bites, this chopped salad looks great, takes minutes to make, and is an easy complement to a variety of summer meals. 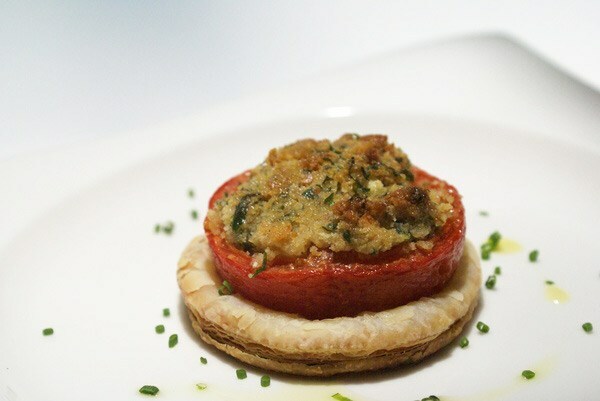 These easy-to-prepare tomato tarts start with crisp puff pastry topped with plump and juicy tomatoes, and finished off with a flavourful breadcrumb crust. 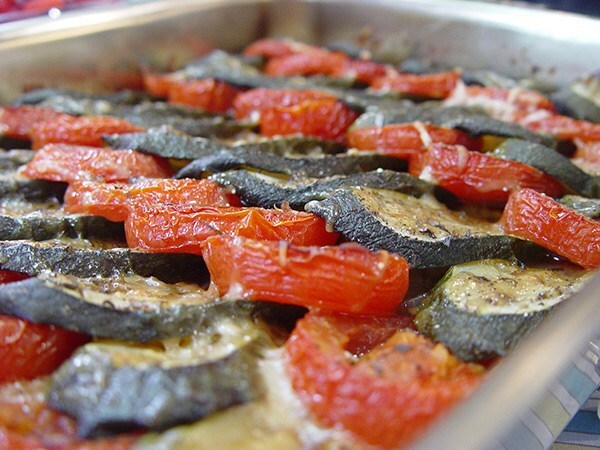 Caramelized onions are topped with layers of tomatoes and zucchini, and finished with a generous sprinkle of Parmesan, before being baked to a bubbling perfection. 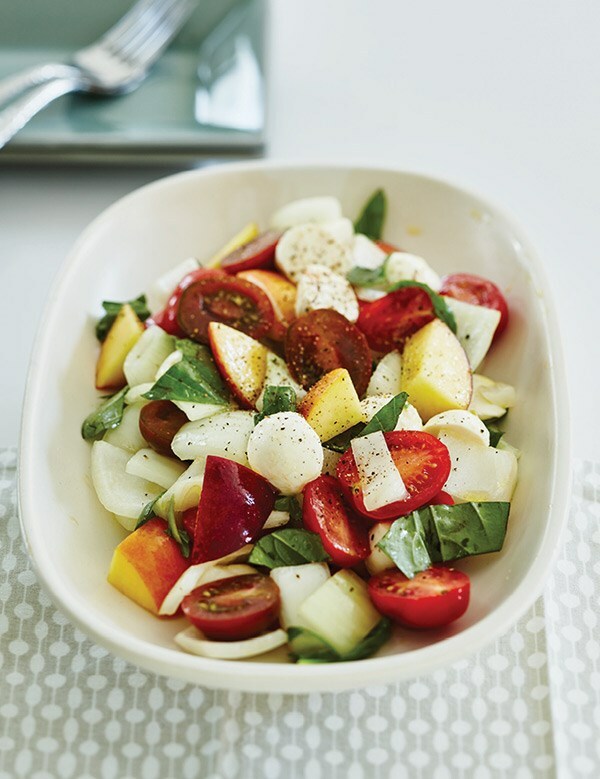 This glorious summer salad makes a nice change from tomatoes and mozzarella. 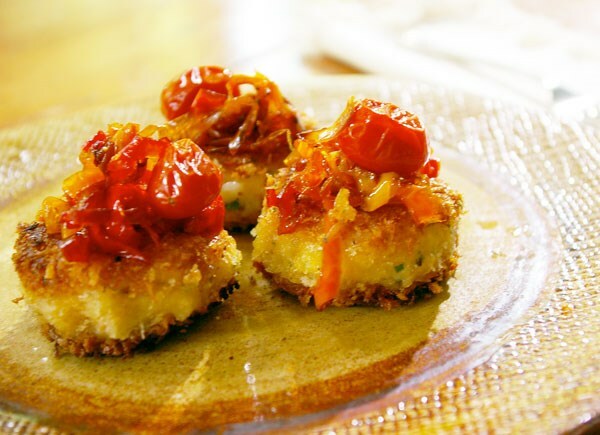 Caramelized peppers and tomatoes served on top of mini fish cakes, this tasty app is sure to be a hit at any party! This dish packs an umami-flavoured punch thanks to toasted seaweed and mirin. 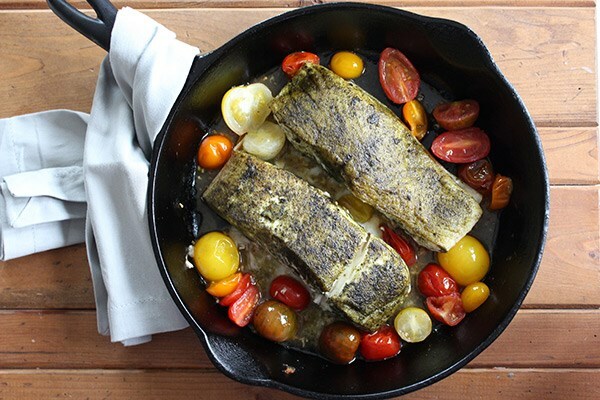 Juicy tomatoes add a sweet, tangy note to this quick and easy salmon recipe from Chef Michael Smith. 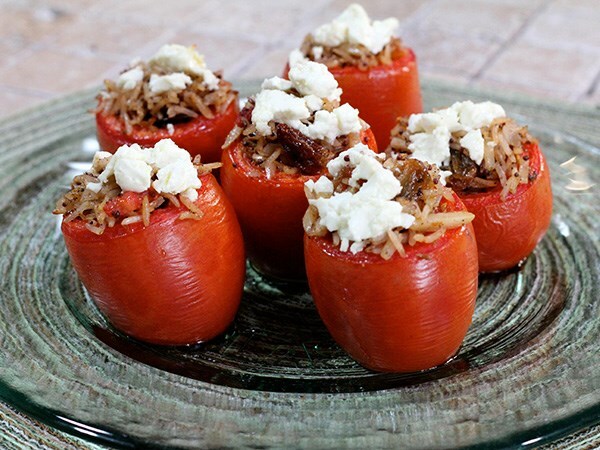 A treat for the eyes and taste buds, these flavour-packed stuffed tomatoes are guaranteed to wow your guests. Giada’s authentic Italian salad is a fantastic fresh and filling accompaniment to hot-off-the-grill juicy burgers or steaks. 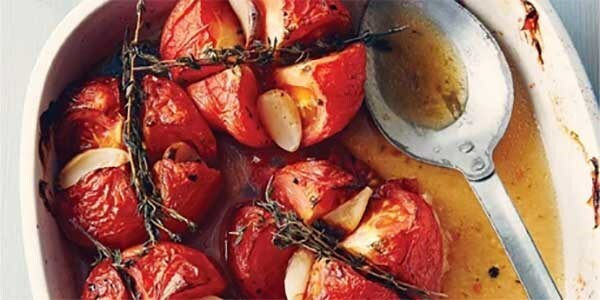 Juicy, plump tomatoes are slow-roasted with thyme and balsamic vinegar in this simple recipe by Michael Smith. This lasagna is perfect for a family Sunday supper when you have a bit of extra time to make something special. 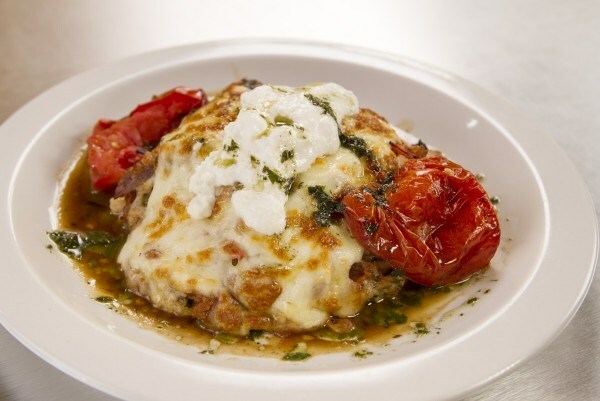 Fresh pasta is layered with a braised meat sauce, roasted tomatoes, spinach and a mix of three Italian cheeses. 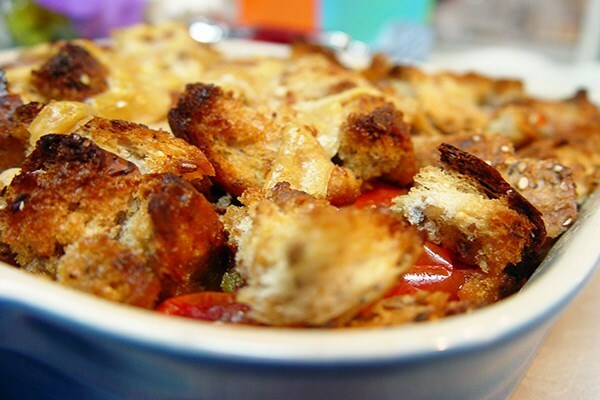 A tomato, onion and garlic mixture is topped with chunks of bread tossed in olive oil, sprinkled with grated Parmesan and baked until the top is crispy and the tomatoes are juicy. 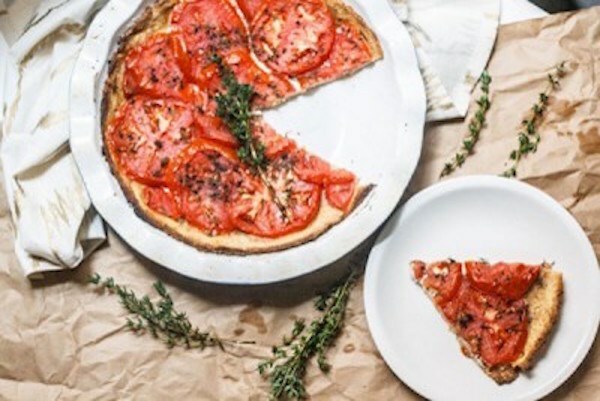 Super easy to make but yielding impressive results, flaky, buttery pastry is filled with grated Emmenthal cheese, sliced tomatoes and sprinkled with thyme.